Haircare brand JOICO has announced its partnership with UK salon group, Marc Antoni. The Marc Antoni Group is renowned throughout the industry for its creativity and business acumen. The company is a family business founded by Bruno Giamattei Snr. 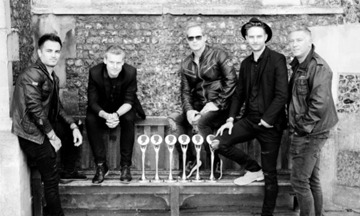 The award-winning business, led by the four brothers, Bruno Marc, Simon, Aaron and Marcus, have five salons based in and around Berkshire. Bruno Marc comments, “We felt JOICO were the perfect company to help Marc Antoni move forward and develop our team, whilst maintaining the five star quality we offer in our salons with their exciting and innovational products,”. Both JOICO and Marc Antoni are delighted to announce the appointment of Bruno Marc as the JOICO Ambassador for Europe, the UK and Ireland with Dan Spiller appointed as the JOICO Color Ambassador for Europe, the UK and Ireland. For more information about JOICO please visit joico.eu.